1 – First on the list – use a Torque Wrench! Most problems reported by customers who try installing X-Heads themselves involve breaking one of the long T50 Torx bolts that secures the X-Head and valve cover to the cylinder because of over tightening and not having used a Torque Wrench. A Torque Wrench must have calibrations in Inch/Pounds or Newton Meters. Tightening torque is 10 Nm = 88.5 inch/lb, or a little less. That equates to screwdriver tightness – NOT socket wrench tightness! DO NOT OVER TIGHTEN! If you have any concern about installing X-Heads correctly, have them installed by a qualified BMW technician. Installation instructions state that “All parts manufactured, designed or sold by Machineart Moto (“MaMo”) should be installed by a qualified motorcycle technician. The risk of injury or component damage is increased by improper installation or misuse of equipment”. 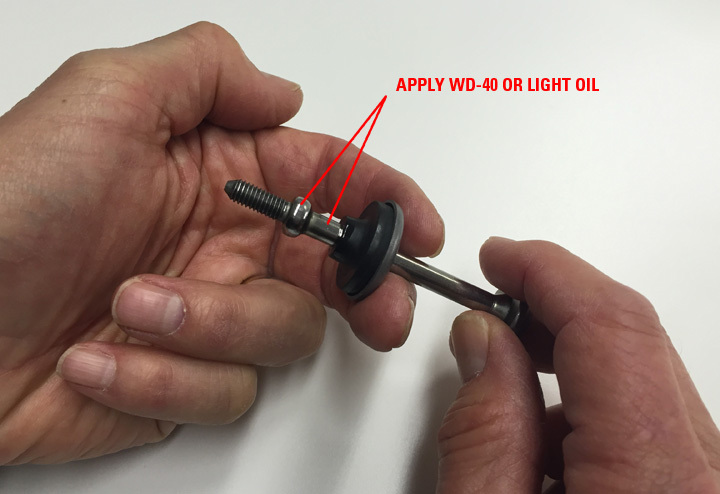 First, apply a little WD-40 or light oil to the ball and bolt shaft. Then, place your fingers behind the cup washer to evenly pull the seal over the ball and minimize distortion. It slips off easily this way. 3. Installation with crash bars: To install X-Heads on R1200 GS/A already fitted with crash bars, they will have to be removed to provide enough working room for X-Head installation. 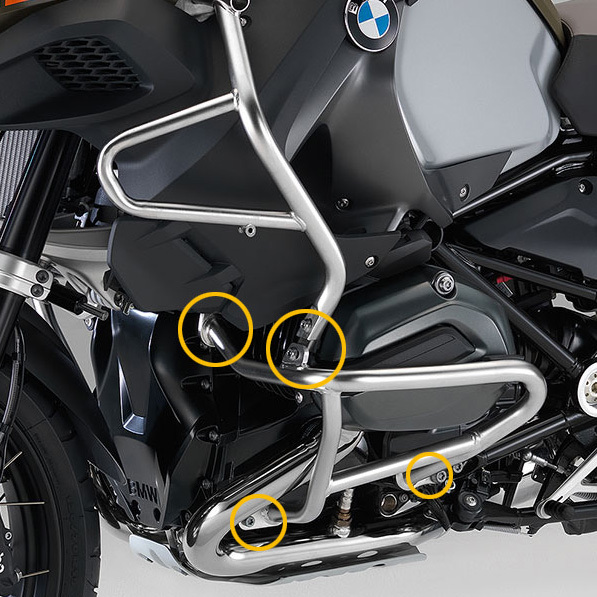 The image below shows the fasteners that will have to be removed on the R1200GS/A_LC. If there is any concern about the procedure, we recommend that removal of the bars and installation of the X-Heads be done by a qualified BMW technician . How does your design not interfere with the cooling of the heads. Thanks much! Craig H.
The cylinder heads are liquid-cooled so this new model so they are efficiently managed thermo dynamically. Our X-Heads are designed to cover about 80% of the face of the head to protect, not only the bottom/front initial impact area in a drop, but also the upper part of the cylinder head. Even in a stationary drop, inertia can cause a bike to roll partially onto the face of the head before it settles down. This product is about protection so we cover a broad area, and the new engine design keeps temperature stable. Thanks for your quick and thorough response. One last question, if I install you cylinder head guards, do I really need crash bars if my riding is primarily, if not exclusively, road? For mostly street riding X-Heads will be sufficient. Some riders do not like the look of all that plumbing around the engine so opt for cylinder guards instead. For off-road riding, X-Heads are a good complement to crash bars to protect heads from weird strike angles onto rocks and terrain that can get past the bars, especially at the rear of the cylinder. 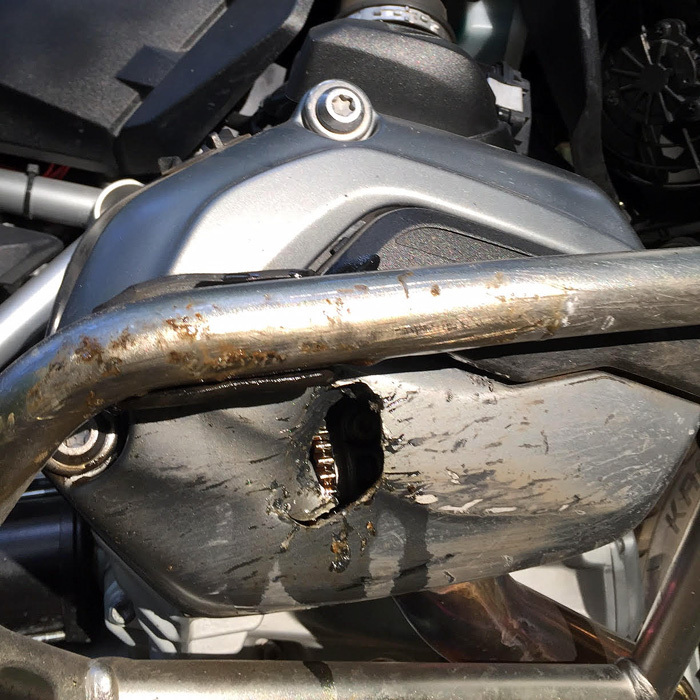 Here’s an example of what can happen without an X-Head, even with crash bars installed.